Wellness is an essential aspect of enriching the experience of medical education. Resident Doctors of Canada (RDoC) is committed to supporting its members’ health and wellness by providing resident physicians with tools that will help them better support their patients and peers, not only during medical training, but over the course of their careers. This year, RDoC will be celebrating National Resident Wellness Day on Wednesday, May 25, 2016 to highlight the importance of mental and physical wellbeing during residency. For National Resident Wellness Day, RDoC is releasing a new infographic with tips and tricks to stay healthy during training. We will also be encouraging residents across the country to participate in a Wellness Selfie Challenge on social media – take a selfie while doing something good for your wellbeing! Please visit your Provincial Housestaff Organization’s website for wellness resources in your province, or to see other wellness activities happening this month! RDoC represents over 9,000 resident doctors across Canada. Established in 1972, we are a not-for-profit organization providing a unified, national voice for our membership. RDoC collaborates with other national health organizations to foster excellence in training, wellness, and patient care. 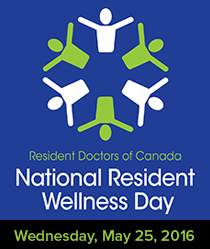 On behalf of the RDoC Board of Directors, I wish every Resident Doctor a Happy National Resident Wellness Day!